Two years on, MakVeto Bikes has exceeded all expectations we had for their ability to create positive change in their community in Northeast Namibia. Last month, they initiated the MakVeto School Financial Assistance Program, supporting twenty-one junior high and high school students to improve graduation outcomes. Rallying around the nascent school program, the entire village Mutjiku decided to convene to figure out how they could help all of the students succeed. Community leaders converged on MakVeto to discuss how to improve youth education. Some of the students were present for the summit. HIV/AIDS patients receive their donated bikes from MakVeto. In addition to discussions about education initiatives, the community voiced concern for neighbors suffering from HIV/AIDS who desperately needed transit to medical care. MakVeto once again generously stepped up, donating ten bicycles to patients suffering from HIV/AIDS. One of the reasons MakVeto Bikes is able to be so generous—donating roughly 5% of their revenue back to their community—is that sales have been brisk. Out of the initial shipment of 427 donation bikes that we sent, there are only 20 bikes left that have yet to be sold. For this reason, Ludwig is very anxious to get their next shipment of bikes from Container #8 and restock the store in a few weeks. After two years of brisk sales, there are only 20 bikes left to sell. Hopefully Container #8 gets there soon! A final note of congratulations: Ludwig has been promoted to manager at MakVeto Bikes, as Erasmus has taken a position with the Namibian Ministry of Environment and Tourism monitoring national parks. Erasmus will continue to be involved with MakVeto, but no longer on a daily basis. We'd like to offer huge congrats to both Erasmus and Ludwig. We're sure they'll keep up the good work in both of their new roles. Some of the 2011 MakVeto School Financial Assistance Program Scholars in their new school uniforms. When we helped Erasmus and Ludwig open the MakVeto Sister Shop in 2009 in the West Caprivi Region in northeastern Namibia, we anticipated that by providing a source of bicycles, we would be helping the local community gain access to health care, education, employment, and market opportunities. A year and a half after the shop opened, it is abundantly clear that MakVeto is achieving these goals and improving the lives of people all over the Caprivi Strip. This Spring, Ludwig and Erasmus decided to take their goal of public service one step further. They kicked off the MakVeto School Financial Assistance Program, supporting twenty-one 8th-12th graders. Students in the program received assistance with tuition, textbooks, uniforms, shoes and school bags. As you can see from the photos of the area surrounding MakVeto, the bike shop is located in a very remote, rural place; the closest school is over five miles away. Young minds, ready to learn. Due to lack of funds for tuition, uniforms, and textbooks, combined with exceedingly long walks to and from school, many students in the area are forced to drop out before graduating from high school. Now with both financial assistance and access to bicycles from MakVeto, the children of this community have found new support in their effort to complete their education and find a path to a better life. It's been a busy spring at MakVeto, our sister shop in Namibia. One of the owners, Erasmus, spent a few months doing tech support for the Tour d'Afrique, the legendary 7500 mile race & expedition from Cairo to Cape Town. Back at the shop, business has been very good. The store is located right on on the main highway (actually, the only highway) between Namibia and Zambia, so truck drivers on their way to and from Zambia have discovered the shop, and stop by when they're in the area to purchase bikes. On subsequent trips, they pick up parts to take home. 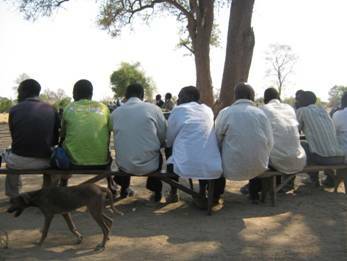 People from northwestern Botswana also have been making the trek to MakVeto. One of our friends reported recently that when he stopped by the shop, there were three customers there having their bikes serviced, and that things appeared to be really humming. Because of the success of MakVeto, owners Ludwig and Erasmus are considering opening a second shop in nearby Divundu. Hearing how far folks are traveling to get to MakVeto demonstrates how important bicycles are in these people's lives: one woman we heard about had hitchhiked over 100 miles to the shop to get tubes for her son's bike! It's been far too long in coming, but here, finally, is an update that describes the scene that we left in the village of Mutjiku, Namibia. As the metalwork was being completed on the container-turned-bike-shop, we scraped its surface and painted it a thick coat of white to ward off the triple digit daytime heat that's common in the summer months. The white paint would also make the MakVeto bike shop stand out from the landscape as people passed by on highway B8—a heavily traveled route by virtue of being the only paved connection through the Caprivi Region. By painting the shop name on the side, with the word 'Bicycles' prominently placed, the entire area would be buzzing with news of the bike shop in short order. With no other signs for miles, save the all-important Elephant Crossing notice, one couldn't wish for a more effective means of outdoor advertising. Erasmus had some experience in drawing and painting, and in fact he had made a logo and sign for the shop that was ready before we even arrived. Taking his lettermark MV straight from the sign, I measured it out and painted it on the side of the container. Once the orange and red paint was dry Erasmus would finish the black parts with a bicycle illustration, the MakVeto name, a listing of their services, and finally a message that mentioned that they're a Sister Shop of Mike's Bikes in California. I felt it was important that these be in his handwriting and not mine. Sadly these last parts could not be completed by the time our stay was up, but we'll post a photo here as soon as we have one. Inside the container, hooks for vertical bike storage were set up. These hooks would hold donation bikes that were freshly tuned and ready to be sold. Shelves and hangers were mounted to store parts and consumables like tires and tubes. The office area was outfitted with a desk, chairs, file cabinet, and a lock for the door. Multiple runs to Rundu for building supplies were made, which was no easy task, for even with our trusty rental truck it was a two hour trek each way. While Ken and I were doing construction and making supply runs, Matt took time to give the MakVeto crew clinics on bicycle repair. With an overflowing pile of donation bikes, there certainly was no shortage of repair patients on hand. And while Erasmus and Ludwig had been given some preliminary training by Bicycle Empowerment Network Namibia, their skills needed some honing if they were to provide quality service to their community. Mukena and Elisabeth (at right) were coming in with no formal training, but over the course of two days of clinics they proved to be quick learners with natural mechanical ability. Starting with the basics of changing tubes, lubricating chains, and adjusting brakes and derailleurs, Matt then went into more advanced fundamentals such as replacing cables and overhauling hubs, headsets, and bottom brackets. At the close of our last full day in the village of Mutjiku, MakVeto bikes was ready to roll with 25 bicycles freshly tuned and ready to give life-changing experiences to their new owners. On the morning of our departure from the Caprivi Strip, we stopped by the shop before running some errands in the area. We caught Erasmus and Ludwig holding their first official staff meeting, which was pretty thrilling to see in and of itself. They were going over bicycle, accessory, and service pricing, and the basics of profit and loss. Matt and Ken were able to give the guys some help in pricing the bikes, which included determining what prices the local people could afford to pay and why some bikes were higher quality (and therefore more expensive) than others. While we were hoping MakVeto would be able to open for business that morning, we got the bad news that the Fumu (the local Tribal King of sorts) had announced that he wanted a personal audience with Erasmus and Ludwig before they would be allowed to sell any bikes. 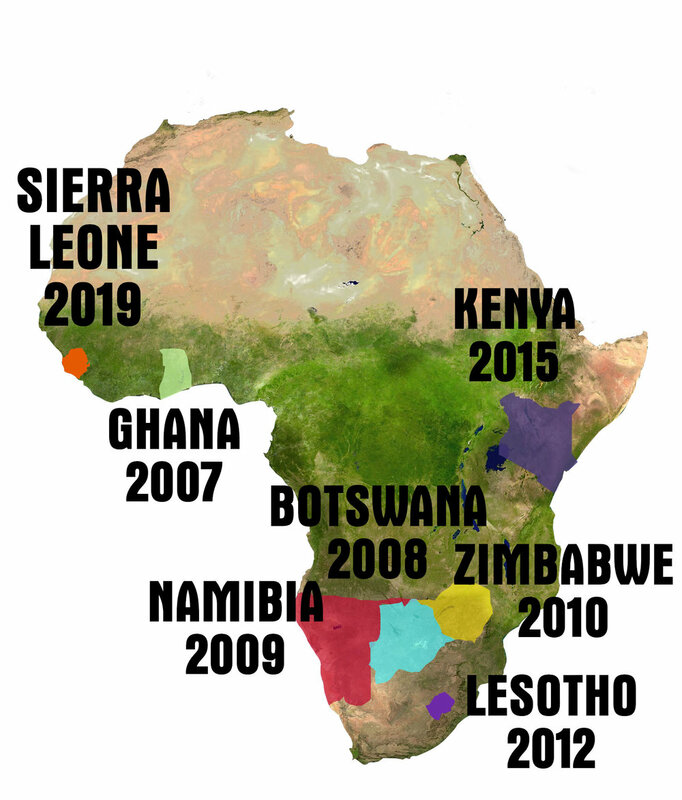 As with many things in this part of Africa, there was yet one more piece of tribal bureaucracy to be dealt with before progress could be made. We then set off on our errands and promised to return for a final goodbye. When at last we were able to get back to MakVeto Bikes one last time, we were surprised to learn that Erasmus and Ludwig had gone to meet the Fumu at the very time we had come to bid farewell. Though it was a little heartbreaking not to be able to see the guys one last time, later on that day we received a text message from Erasmus that made us all cheer out loud. "Fumu let us open the shop. Today we sold three bikes. Thank you guys for all you have done!" We'd like to add one thing: Thank you to all our Mike's Bikes customers for all YOU have done too. When you need a big metal box to be proper habitat for a bike shop, you've gotta have a guy. Now we had a bunch of bikes, and a big metal box, but unfortunately these two things alone do not a bike shop make. We needed a second door and a window in the box to make it feasible as a work space, and we also needed to make an outdoor shade structure for repair work during the heat of the day. We needed a guy, and Erasmus knew where to find him. When we first drove up to Diwiwi Welding, we found a hand-painted sign with a spider logo, a shack with a sliding metal door (instead of the wood ones that were typical), a bunch of random metal debris in the yard, and nothing else. The proprietor, Alex, was nowhere to be found. Erasmus walked behind the shack and disappeared for ten minutes or so. While he was gone we were more than a little worried. We had just three full work days before we'd have to leave, and there was a lot to be done. What if he was away from the area entirely? There wasn't exactly a lot of competition for metal fabricators on the west end of the Caprivi, and if this was the case we'd probably be completely out of luck. Thankfully Erasmus learned from Alex's family that he had gone to the local market and that we could find him there. The exchange at the market was an interesting one. We indeed found Alex immediately, he stuck out from the crowd with his stylish woven fedora hat and oversized sunglasses. We introduced ourselves, outlined what we needed done, and asked him for an estimate. After we figured out this meant he wanted to negotiate, it was pretty obvious he'd be doing his best to extract as much money from the foreigners as he could. It wasn't surprising of course, business is business, but we spent a frustrating little bit of time going back and forth with him and not getting any kind of number on the table. So we told him we'd pick him up early the next morning to get to work on the project. What else could we do? Over the course of the next few days, our experience with Alex would prove to be pretty entertaining. We borrowed a generator from Ludwig's neighbor to supply him with power, and he brought a 110 volt hobbyist-style stick welder along with a large angle grinder and a power drill. These things were unheard of in the local villages, so we were more than thankful that he was so well equipped. He worked long, hard days in the hot sun the entire time, but let's just say precision was not his forte. He mistakenly cut the bottom slice for the door much too long, and he had to cut and re-weld the door frame section after messing it up more than once. Yet in the end, Alex did get the jobs done that we needed, and in the bush with triple digit heat and little shade, this was certainly no easy task. The man was quite a character, to be sure. His mastery of english was not nearly as good as Erasmus and Ludwig's, but when he did speak it he would often do so in a drawling style that seemed, maybe, to be on purpose. Even a bit cocky, perhaps. And when the time finally came to "negotiate," he took his demands much farther, even, than we expected him to. For example, one of the things he tried to charge us for was travel expenses, even though we went well out of our way to pick him up and drive him home every day. He tried to charge us for materials as well, but we provided everything right down the the welding sticks and cutting wheels. In the end, we handed the dealings with Alex over to Erasmus and Ludwig. We knew they had a real grasp of what constituted a fair price here, and we wanted to see how they would handle one of their first business deals. This proved to be a good move, and the boys impessed us once again. They went back and forth with Alex line-by-line, and after much hemming and hawing his fee ended up being one third of what he showed us to begin with. It was still a kingly sum for a typical worker in the Mutjiku area. 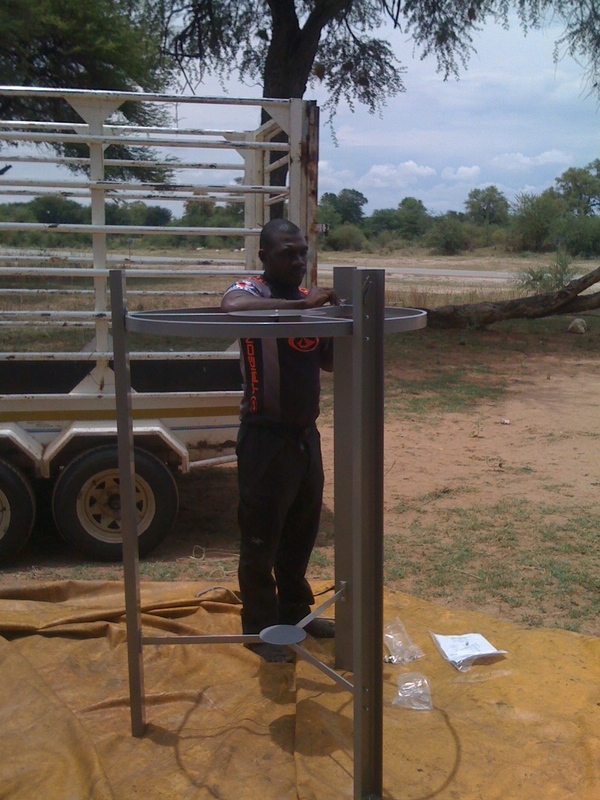 But really, when you need metal fabrication done in the bush in Namibia, you've gotta have a guy. And sometimes that guy's just gotta get paid. Erasmus and Ludwig needed to go through a complicated bureaucratic process with the local tribal authorities in order to gain approval to open their bike shop, and this handwritten letter was the official okay they received. Even though they had jumped through all of the right hoops, as soon as the container showed up and word spread around the area that something big was happening in Mutjiku, there was apparently a bit of jealousy and suspicion as to the aims of these foreigners and their load of bicycles, and as to why Erasmus and Ludwig had gotten such fortune bestowed on them. When we arrived on Wednesday morning to continue work on the site, we were surprised to find out that we had been summoned to meet with the tribal Headman for an interview. While its purpose ostensibly was so that he could be sure we weren't trying to lay claim to any of the local land (leftover mistrust from colonial days) or lay any claim to the business assets that we were donating to Erasmus and Ludwig, it was all simply a long and tedious exercise that we found out later on was caused by the Headman not having notified his superior, the Fumu (the tribal king) properly about the bike shop plans. It was an exact parallel to some of the bureaucratic nonsense that happens every day in the U.S.
As silly as it was (Erasmus and Ludwig were visibly annoyed the entire time), the experience was something we'll remember forever. 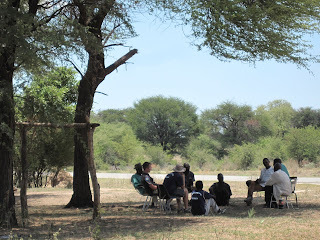 This official meeting with the Headman took place under a thatched roof shade structure with chickens running around our feet and roosters interrupting the procedures with sporadic ear-splitting cries. The man himself was one of the few people we have seen here who had any kind of portliness, and in the heat of the day he wore a knit sweater and black pants with well-worn black dress shoes. He spoke dramatically in the local tongue and took every opportunity he could to try to impress us with his authority. Click on the video link below to hear some audio from the camera that was in my pocket during all of this. At first you can hear the tribal headman talking, then Erasmus' father speaks and is interrupted at :27 seconds by a rooster. Bureaucracy in Mutjiku, Namibia from Mike's Bikes on Vimeo. After much pontification and back-and-forth about what meetings we should have scheduled and which forms should have been filled out, he thanked us for our kindness to their community and explained that when outsiders come in with money and resources it sometimes brings unforeseen consequences and obligations from the people of the village. To "make sure" everything was on the level, we were required to pick up the local Gentleman who was the local Land Board Member and have him do an "inspection" of the Makveto shop site. We obliged of course, and this led to more running around and general wasting of valuable time. Following the "inspection" (which was nothing more than the Gentleman walking around looking important) we were asked to sit with this Land Board Official and the Headman again. And so the day went on like this, round and round, shuttle here, sign this there, etcetera etcetera. At long last we were told that these men had to be compensated for the time that they had taken (from us) that day, and they asked for N$200 (the equivalent of around $30 U.S.) We watched the two officials split this cash and pocket it before we dropped them off, and at long last we were allowed to continue our work. Rugged and isolated as this land may seem, we learned this day that even in rural Africa red clay buildings sometimes turn out to be nothing more than factories for red tape. Bicycle Retail 101, or perhaps 98A. Following the container unloading adventure we provided lunch for all of the workers. We also announced a donation to Mutjiku Youth Against Crime, who had been such a great group of helpers that morning. Almost immediately the youth group decided to use the money to have t-shirts made. This again demonstrated the popularity of the custom t-shirt in Mutjiku, but it also would be quite practical as most of the clothing the kids were wearing was in a very sorry state of repair. The next step was to talk some business with Erasmus and Ludwig, and though we had been hearing amazing things about them from Kami we really didn't know what to expect from the guys in this regard. We headed back to Kami's house in Buffalo with the boys to look at some spreadsheets she had made with them and go over their receipt books. Within an hour or so, we were pretty much floored. These guys really had excellent heads for this kind of thing. They had been keeping records of all of the supplies and expenses they'd had to date, and most everything was accounted for from our initial get-the-ball-rolling donation to them. They had set up a bank account and had already agreed that they would employ Mukena and Elisabeth on a volunteer basis for the first two months, before they had enough revenue to pay salaries. And they had pledged to not pay themselves at all until the business had started to earn a profit. It seemed most everything they had done so far was sensible and prudent, and frankly, it was impressive. We helped them determine the best methods of keeping records for goods that they sold, and how best to track their expenses. Standards for calculating profit and loss were set, and Erasmus and Ludwig sucked it all up like sponges. We even had some discussions about marketing, and were enthused about the plans they had made in this regard. They were going to make flyers and ride to all the local villages to distribute them on bikes. They were even planning on organizing cycling events and group rides and claimed that there was already much interest in this within Mutjiku and the surrounding towns. We even heard the words 'bike race' spoken more than once, and we only hope there is a chance that we're somehow around to witness what a bicycle race on the Caprivi Strip would be like. The entire theory behind the Mike's Bikes Sister Shop program is that with good management, hard work, a little time, and the kick-start of donation bikes, these fledgling shops would be able to bring more and more bicycles into their communities—many times more than just the initial donation container. With tools, training, and access to supply lines, they would also be able to service and repair bikes to keep them on the road and serving their owners. And, most importantly, they would be a completely self-sufficient force in establishing the use of the bicycle for transportation in areas where people have no other options. While we were astonished at the steps Erasmus and Ludwig had taken before our arrival—not the least of which was constructing a free-standing office hut complete with a concrete floor, mind you—this meeting cemented in our minds the fact that these guys had the brains, the talent, and the sheer gumption to make this thing work. If anyone could establish a bicycle transportation movement in the Caprivi region of Namibia, Erasmus and Ludwig were the guys to do the job. 35 meters east of the Elephant Crossing sign in Mutjiku, Namibia, a bike shop was born. 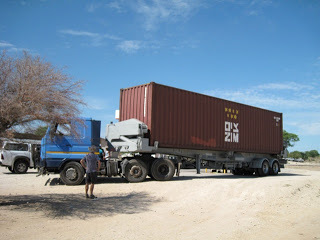 When we arrived with the container rig at Erasmus' homestead in Mutjiku, we were blown away by what we saw. His entire extended family and many friends and neighbors were gathered outside waiting for us. Groups of children gathered in the shade to witness what was happening. The offloading process with the truck's built-in lift was amazingly smooth, and so much easier than we had expected from our trials in trying to find a working crane and operator in Botswana last year. There were two moments of panic on our part when the drivers had trouble with an air line fitting and then couldn't get the hydraulic motor started. Both were solved, the box was placed down next to the small office hut that Erasmus and Ludwig had built, and we were ecstatic. Almost immediately everyone dove into a flurry of activity. While the container was being opened, Erasmus and I rounded up the youth organization that he had founded, Mutjiku Youth Against Crime, who were to be our hired help for the day. As we returned to the container site, we saw that the crowd had grown and grown. Matt, Ken, Ludwig, and Mukena were offloading the bikes at a dizzying pace, and the crowds of local men, women, and children had made a game of matching bikes to their front wheels (removed to pack more into the container). Once both wheels were on, the bikes were then rolled down the path to a store room (formerly a family gathering place) in the middle of Erasmus' homestead. Many of the young boys made a race out of getting the bikes back and forth down the pathway to storage, with ensuing cuteness and hilarity. I find it hard to put words to what happened that morning. To see the bikes bring such joy on the kids' faces, and excitement to the adults'—it was just indescribable. The whole activity of unloading and matching up bikes and wheels with us trying our best to help instruct the flood of people that were eager to help—it was raucous, chaotic, and one of the most utterly beautiful things I have ever witnessed or been a part of. I can only hope that pictures will do some small amount of justice to the story. I'm sure most of you have had the pleasure of passing through the village of Mutjiku, in the Caprivi Game Reserve region of Namibia. Maybe on your way to the hardware store in Rundu, or while running errands in Divundu. But I really shouldn't assume these things, so maybe a few details about this place and how we came to be here are in order. Caprivi is a narrow strip of rugged land that extends like a panhandle off of the north east corner of Namibia. Sandwiched between Angola and Zambia to the north and Botswana to the south (mmmm, panhandle sandwich), the main feature of this area is the Kavango River which runs right through Mutjiku and is the source of water (and life, consequently) for the people of the village. Mutjiku consists of parcels of land that are granted to individual families through regional tribal authorities. These parcels typically have family homesteads clustered on them, like Erasmus Kaveto's family plot where the Makveto bicycle shop will be located. These family plots are used for both crop growing (about nine major types), animal herding (primarily cows, goats, and chickens), and for the family dwellings. One of the most incredible things in fact, are these domiciles. There are many variations, but the most common way they are built consists of finding certain types of termite-resistant wood for a simple frame, molding walls from clay, sand, and sometimes reed covering, and making thick thatched roofs from reeds bound together. These houses have a simple, sturdy, honest beauty, and the better ones are surprisingly cool even in the triple digit heat that comes on a typical day here. We have been staying with our very gracious host Kami, who is a Peace Corps volunteer working on HIV/AIDS issues here in Caprivi. She has been extremely helpful to our project in too many ways to count, starting with the original connection to Erasmus and Ludwig. When the Bicycle Empowerment Network (BEN for short, an amazing group who have helped us greatly in our efforts) volunteered a bike as a prize for an HIV testing event that Kami was putting on, she became aware of their efforts and quickly became friends with Michael and Clarisse who run the operation in Namibia. Meanwhile, Erasmus and Ludwig just happened to ask their neighbor (Kami) to print out a plan for a bike shop project that they came up with and were looking for funding to make a reality. Kami got in touch with BEN, BEN got in touch with Mike's Bikes at the exact time we were searching for our next Sister Shop project, and the rest is history (or present, as it were). Kami has lived in Namibia for three years, and her house is just up the road from what you might call Mutjiku proper (a crazy concept, really). We have found her home to be extremely charming, cozy, and surprisingly comfortable. She gets her water from a solar-operated bore pump, and even has just a bit of electricity now and then also from a small solar array. We have helped Erasmus and Ludwig procure a solar power system for their Sister Shop, but these systems are far from the norm around here. The vast majority of people in this area live entirely without running water or electricity. 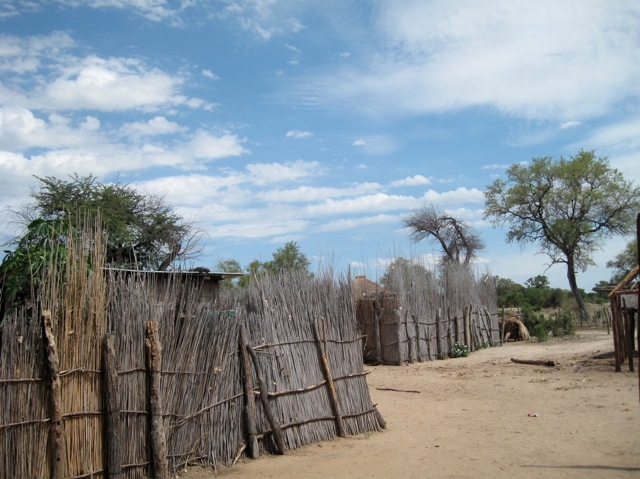 Caprivi is the region in Namibia that is most impacted by the devastation of the HIV/AIDS epidemic. The infection rate per capita is roughly 37% here, compared to around 18% for the rest of the country. This is what brought Kami here to try to help make a difference, and giving the people easier access to testing and health care is one of the main reasons we are excited to be setting up our Sister Shop here. Heavy loads are transported on sleds driven by oxen and smaller ones are moved on foot. Like in Gaborone, Botswana we found ourselves amazed with the overwhelming number of people walking. Everywhere we go in the Caprivi, there are always people walking, no matter how far away we are from anything, no matter how heavy the loads they carry, no matter what time of the day or night it is, people here walk. Unlike in Gaborone, we are thrilled to see that there are at least a small number of people on bikes here! Not surprisingly, there is no private vehicle ownership at all in Mutjiku or in the nearby villages. When they were dreaming up the idea of a bike shop project, Erasmus and Ludwig actually conducted a survey about bicycle use here. They came up with 213 bicycles currently in service in the Caprivi region, and a startling 318 that are off the road awaiting repair. With a total population of roughly 19,500, there is obviously a long way to go with increasing bicycle transit in Caprivi, but we're thrilled to be looking at tripling the number of bikes in use with the donation shipment. And what's more, with Makveto supplying much needed parts and mechanical service, the 318 bikes that are off the road will hopefully be up and running soon, where previously there was little hope for them at all. Thanks for bearing with these sporadic updates. A brief note: Internet connections have proved very challenging to acquire in Namibia, which is no surprise, really, as the region we have been working from is very remote. As in, no running water and no electricity, THAT kind of remote. Please bear with me as I update as frequently as I am able to. Photos are particularly difficult, as they require a strong connection, so rest assured mountains of pictures will go out as soon as the connection is fast enough. OK, on to some updates! After our long journey across North-Central Namibia we have arrived at our new home for the next few days, a camp at Buffalo Game Park on the Caprivi Strip. Peace Corps Volunteer Kami, who drove with us from Windhoek yesterday, and who continues to be instrumental in our efforts here, has lived at this camp for a year and is proving to be both an invaluable link between us and the people of this area and a truly excellent host. I almost cannot form words for the things we saw during our drive here, though I'll certainly try in a future post that's not a truncated update. I also am completely blown away by our camp, which is a series of primitive (by Western standards) mud-clay huts crafted in the local style that manage to somehow be charming, comfortable, and utterly ingenious. Yet our experience this morning at Erasmus' family compound, to me, completely surpassed everything that has come so far. In addition to Erasmus, we met Ludwig, Elisabeth, and Mukena, who will be the crew at the Makveto bike shop. And what a crew they are! The work and planning they have done so far, without yet even having seen the container of bikes, has completely astounded us. And they were incredibly gracious hosts, taking us on a lengthy tour of the family land and giving us an unforgettable window into their daily lives. This tour has left a mark on me that will last a lifetime, and I'll detail it in a forthcoming post here. One large hiccup from our first day here: We were expecting the container of bikes to arrive at the shop site this morning on Erasmus' compound, and it did not come. Shockingly, there is a cell signal here (which is nearly as incredible as anything we've yet seen), and a call came through to let us know that it will arrive early tomorrow morning. Needless to say our fingers, and those of the Makveto crew, are crossed. Hard.